What’s inside: The Laundry Products that Will Make Life Easier + 5 Common Laundry Myths Debunked. Sponsored by Tide available at Walmart. I’ll be honest, laundry wasn’t always my favorite chore. But then I realized I was unintentionally making things harder on myself! I’ve always been pretty “old school” when it comes to my laundry routine. I used to skip over the new laundry products at the store, like pods and beads. I wasn’t sure how they worked and I was a bit stuck in my ways. 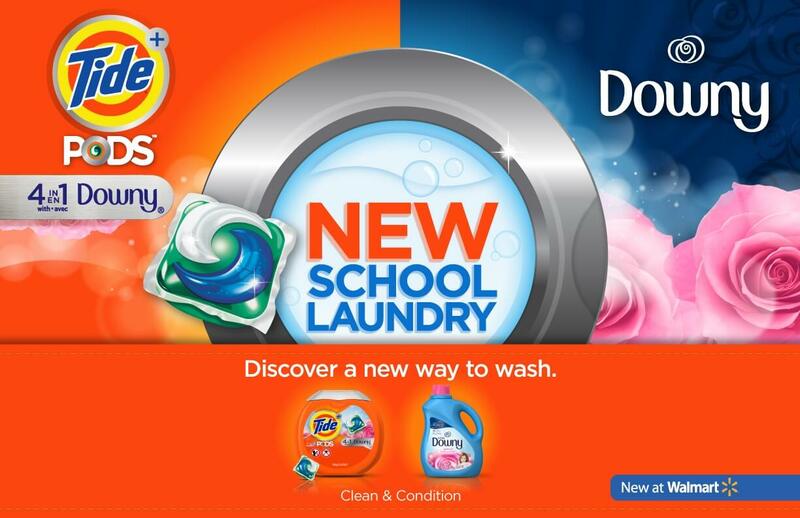 I’m so glad Tide available at Walmart, invited me to get educated about the ”new school” way to do laundry! It makes doing laundry enjoyable (it’s easy and I love the fresh smell) AND saved me money! 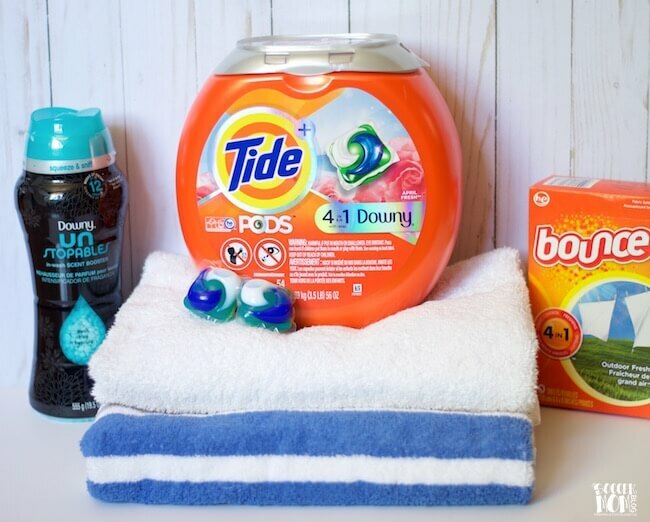 Keep reading to find out the truth about some of the most common laundry myths and the tricks I learned from Tide to make doing laundry a breeze! 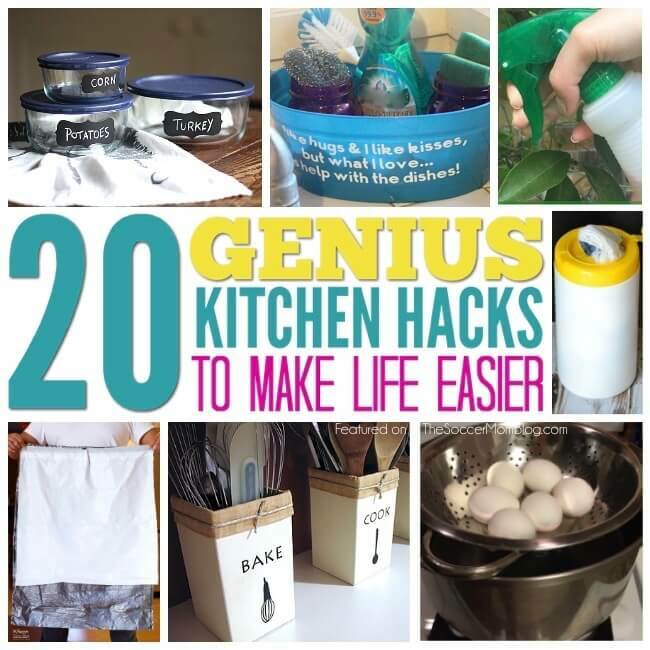 PLUS I’ll tell you how to snag free samples of my favorite laundry products! 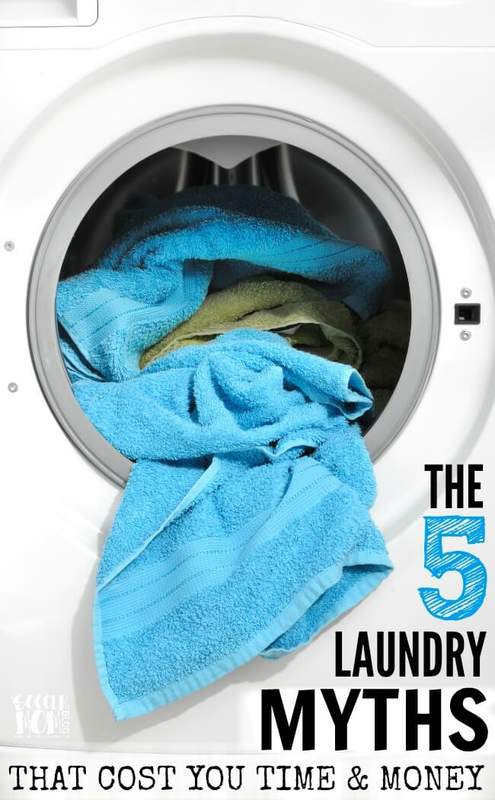 5 Laundry Myths – Busted! Myth #1 — New laundry products, like pods and beads are a confusing and hard to use. 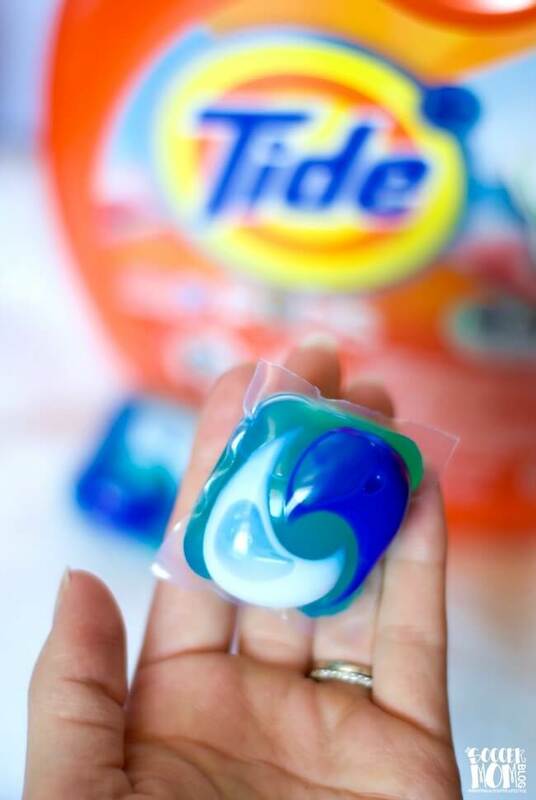 Tide PODS plus Downy contain detergent, stain remover, brightener, and Downy Fabric Protect technology — that’s four products in a single concentrated pod! Simply toss a Tide POD into the washer with each load and go on with your day! 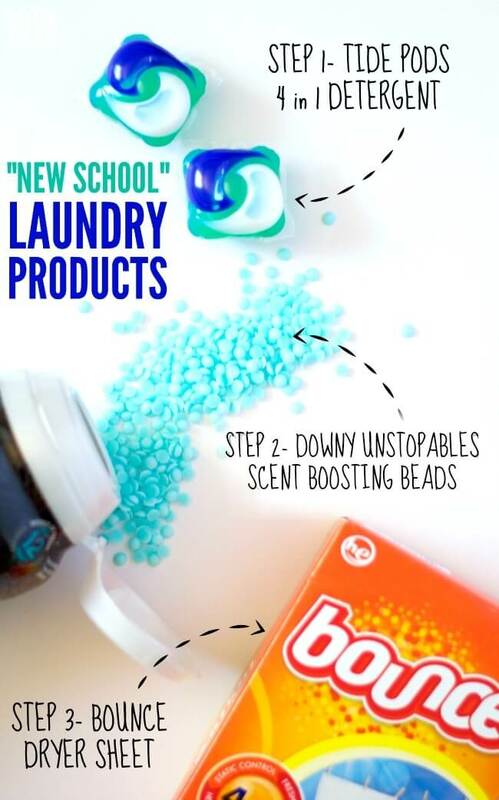 Add scent boosting beads (like Downy Unstopables) to the wash cycle and follow-up with a Bounce dryer sheet to complete the easy 3-step regiment for amazingly clean and fresh-smelling clothes. Myth #2 — Laundry pods are more expensive to use. FACT: One misconception I had about these new laundry products is that they are not budget-friendly. However that couldn’t be further from the truth! Tide PODS plus Downy require no measuring, so you get precisely the right amount of detergent every single wash. There’s no over-pouring and no waste, which means you won’t end up purchasing more detergent than you need. Myth #3 — Cold water doesn’t really get clothes clean. FACT: New laundry technology in both detergents and washing machines means that you can achieve a deep clean with cold water. (Source) Plus, cold water is less damaging to clothing, easier on the environment, and helps keep your electricity bill lower. Myth #4 — Towels always need to be washed separately. FACT: It’s perfectly safe to wash towels with any other cotton clothes. Just be sure to wash lycra or spandex-based clothes apart from heavy cotton items to avoid breaking down the delicate fabrics and/or damaging antimicrobial properties. Myth #5 — Your washing machine is already clean because it “washes itself” during each laundry cycle. Fill your machine with hot water and add about three cups of white vinegar and a half cup of baking soda and allow to sit for 30 minutes. Run a regular wash cycle and your machine will be clean as new. Use any leftover white vinegar to spray on and wipe down the drum and all seals. New School Laundry events are happening in more than 1,000 Walmart stores across the country in the next week. There are several in the Houston area that are participating in the tour. I’ll be at the Walmart Supercenter at 155 Louetta Xing in Spring, TX on Saturday at 1:00 p.m. so come see me! Stop by your Houston area Walmart from 1:00 p.m.- 6:00 p.m. on Saturday, April 8th for free samples and coupons! Participating stores listed below. Tune into Great Day Houston Friday, April 7th on channel 11 at 9 a.m. to catch me sharing more tips on doing laundry the new school way. I admit, I’ve always thought towels had to be separate AND I always wondered about cold water. Thanks for this info. Very cool!